The small Central Texas town of Llano, entirely dependent on a river that's now only a trickle, is facing potentially draconian water restrictions. And it's not alone. If rain doesn't come soon, more cities could too. LLANO — In this small Central Texas town, watering lawns, no matter the time of day, is forbidden. The local sausage factory has voluntarily cut down its meat-making operations from five days to four, to save a day of washing up. Children can still swim in the Llano River, but no longer have the illicit fun of leaping off the town dam — too little water runs over it. Llano is entirely dependent on its namesake river for its community water supply. 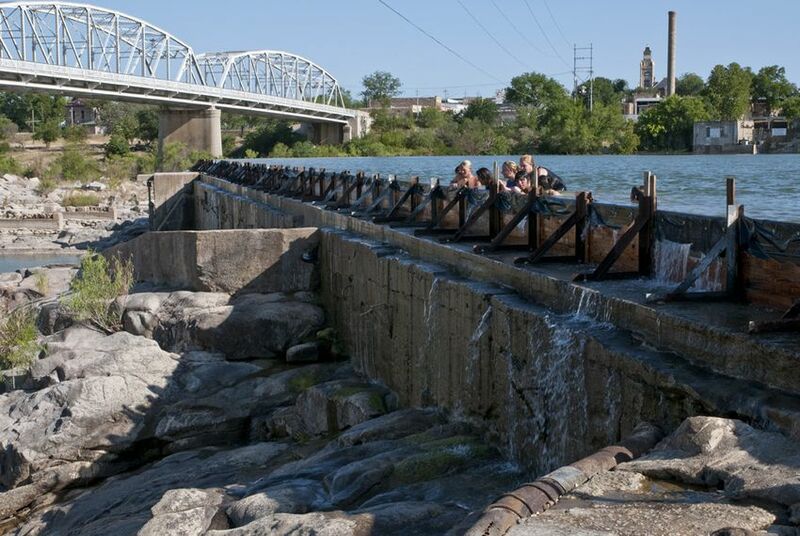 If the river stops flowing altogether — which could happen sometime next month — the city has estimated, conservatively, that it has 60 to 90 days of water storage in its reservoir, city manager Finley deGraffenried told the Tribune. "We are planning for the worst and hoping for the best," said Mike Reagor, Llano's mayor, at a city council meeting devoted mostly to water on Monday. Among the considerations was whether to prepare for possible importation of bottled water, though deGraffenried said he thought such talk was "premature." Texas is dryer than in any previous October-through-May stretch in recorded history and if rain doesn't come soon, more towns and cities may find themselves facing the same situation as Llano. On Tuesday the federal Department of Agriculture declared most of Texas a disaster area due to drought, and many Texas communities are in the first stage of water restrictions. In Austin's case that means limiting lawn watering to two times a week and only at certain hours; for Waco, it means asking for voluntary water reductions, starting this week. San Antonio now allows sprinkler use just one day a week. Llano went to the fourth stage — which includes no outdoor watering — last week. 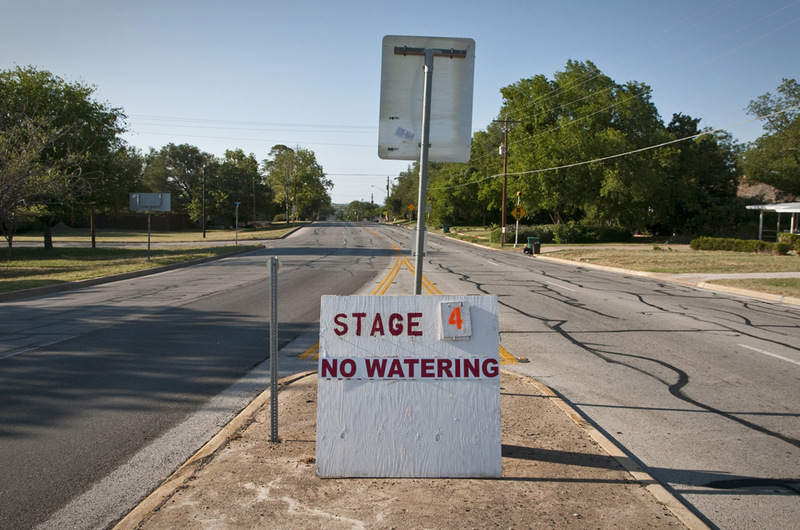 Makeshift signs around town read "Stage 4 No Watering." Stage 5 will be declared if the river stops flowing, which would trigger further reductions in water allocations. At least one other area of Texas has imposed very severe water restrictions. The Cow Creek Groundwater Conservation District, in Kendall County, recently went to "Stage 5". This requires all permitted groundwater users to cut their water consumption by 40 percent, in response to falling levels of water wells, which have had no rain to replenish them. Lawn sprinklers are banned (hand-watering is still allowed), as are charity or home car washes. "We're just trying to get ahead of the curve, and ask people, 'Let's slow down on your water use,'" said John Kight, the vice-president of the groundwater district, adding: "You'd be surprised at the number of people who call in and say so and so is watering." It bears noting that water restriction stages mean different things in different communities. So one community's Stage 5 may be just as restrictive as another community's Stage 6. The city of Boerne, which is within the Cow Creek district, only recently went to Stage 2; it has additional sources of water supply besides groundwater, Kight said. In Llano, the Stage 5 restrictions, which one council member said could be imposed in the early to middle of next month, currently require cutting average water use in half. However, the city council is considering ways to perhaps ease the harshness of those restrictions, with the goal of not penalizing people who have been conserving water all along, deGraffenried said. For some businesses in towns, the severe water restrictions are scary. Llano emphasizes that it is still very much open for tourism — swimming is still possible above the town dam, for example — but some potential visitors have read about the water problems in Central Texas papers and canceled their bed and breakfast or other arrangements. "We've had a few businesses say, 'It's hurting our businesses,'" said JoAnne Smith, executive director of the Llano Chamber of Commerce, who said her group had gotten a number of calls from people inquiring whether it was still possible to swim. Bryan Miiller, of Miiller's Llano Smokehouse, which makes sausage and smoked meats, said that the restrictions had had little effect on his business, other than his voluntary move to shut down production one day a week, to save water on an evening cleaning. "Of course at home, we're letting the yard die, like everybody else is," he said. Besides the water supply, there are other problems associated with drought. "If we do hit zero flow [in the Llano River] and the reservoir starts going down, we'll start finding it's a lot harder to treat the water," said Reagor, Llano's mayor, at the council meeting. "If you talk to citizens who were alive in [the extremely dry year of] 1956, the water was pretty gucky." Another worry for drought-plagued communities is fire. "The problem is there's no water in the ponds to get water to fight the fires with," Knight said. Some farmers, their crops already lost, have tried to plough their fields, especially when a recent wildfire threatened them, but "the ground's so hard you can't plough," he said. Llano is currently moving forward with some well-drilling, in the hopes of getting more near-term water. However, said deGraffenried, Llano doesn't have the luxury of sitting above an easily accessible aquifer — it's essentially built on granite — so the main hope is to capture water that's in the gravel beds below the surface. In the long term, more stringent drought planning will be key to preventing another disaster. "The rule of thumb in planning is you have enough water to get your entity — get your supply through a repeat of the drought of record," said Tyson Broad, co-founder of the South Llano Watershed Alliance, a nonprofit water management group, referring to the drought from 1947-57 that is still considered the worst in Texas history. "Basically Llano does not have that capability at this time." Such planning can be hard, Broad added, particularly in a small community with "basically a volunteer-based government" that has a variety of issues to deal with. Locals agree that something will need to change in the years ahead, and at Monday's meeting, the council began to consider investigating other measures, such as dredging the lake to make it deeper and able to hold more water. (Temporary 30-inch boards got put up in late May to make the reservoir slightly higher, and hold more river water.) These measures will be expensive and are particularly painful for a small community in a time of budget cuts. But they may be necessary, especially to allow for future growth. "Ten to 15 years from now, we're going to have other dry summers, not just this year," said Miiller, who owns the meat shop. "I think we are going to have to take a serious look at developing other sources of water, whether it be drilling wells — something to supplement the river water."